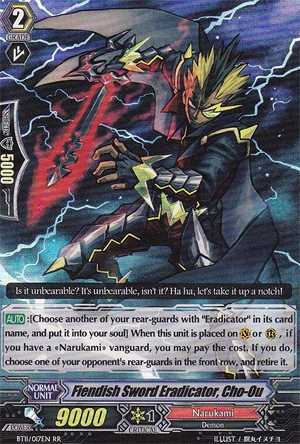 [AUTO]:[Choose another of your rear-guards with "Eradicator" in its card name, and put it into your soul] When this unit is placed on (VC) or (RC), if you have a «Narukami» vanguard, you may pay the cost. If you do, choose one of your opponent's rear-guards in the front row, and retire it. What's up, you guys?! It's Monday and time to review some more awesome cards from Set 11! What do we have this time? ...Cho-Oh is probably one of the better cards I have seen in this set and probably one of the best tech cards to put in to your Eradicator deck. Why? Well, he's got a solid 9,000 power, an effect that doesn't require Counterblast and actually fills up Soul for other units like Sweep Command Dragon or Rising Phoenix and he retires your opponent's rear-guards! The only major drawbacks to this is that you have to offer a different Eradicator aside from itself and that you can only retire frontline rear-guards, which still isn't that bad, and putting it at 9,000 power means that he's going to be on the field for a nice while until needed for Intercept or taking a hit. In short, if you are playing Eradicators, play 2-3 of him because he's that good.